This is a bold, bright new series for babies. It follows on from the Cot Book series and Baby's First Flashcards. Each book contains beautifully designed high-contrast images that are easy for babies to focus on. The words are onomatopoeic, providing easy prompts for parents to make sounds for their babies to hear, essential for their speech development. 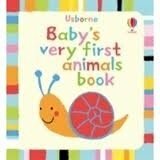 Each little padded 'soft touch' hardback is perfect for sharing or can be propped up for babies to see.